When Jennifer Lien won the role of Star Trek: Voyager's resident Ocampa, Kes, she was completely unprepared for what followed. "I had no idea what I was getting into," she explains. 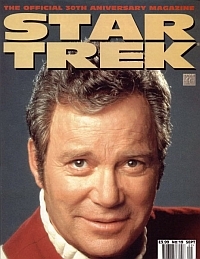 "I was familiar with Star Trek, I had no problem with it and I enjoyed watching it, but I wasn't really aware of the magnitude of the Star Trek phenomenon. I suppose that was lucky in a way, because I didn't feel any pressure or anxiety whatsoever; it was all fun and exciting. "I'm beginning to learn how people react to Star Trek and how significant it is to a lot of them," she continues. "It's really fascinating - it's just a incredibly vast institution. Born and raised in Illinois, Lien was just 13 when she performed in local Shakespeare productions. She made her television debut in Brewster's Place before landing starring roles in the daytime soap Another World and the short-lived sitcom Phenom. Shortly after that show's cancellation, Lien read for the Star Trek: Voyager feature-length pilot, Caretaker. "I really enjoyed the story. I liked the idea of playing a young, open-minded and strong character in a science fiction show. I was also excited by the fact the Kes was one of a new alien race, which really opened things up for future storylines; it meant that anything could happen, offering me the chance to learn and grow as an actress. The 21-year-old actress insists television acting isn't as glamorous as most viewers imagine. "I start the day going through three hours of hair-styling, make-up and wardrobe. At the end of shooting, they put oil on my face and rip everything off. I go home, grab a few hours' sleep, and then have to get up at about three o'clock in the morning to start all over again. What's glamorous about that? "I lead the same life I led before joining the show, except I occasionally go into the studio and work," Lien continues. "My lifestyle really hasn't changed; I don't get recognised very often. When I'm not playing Kes, my skin colour is different, my hair is different and I don't have those ears, so I have a great deal of anonymity. Whilst the actress is aware that Kes, as an Ocampa, has a life expectancy of little more than nine years, she is unconcerned by the thought that her character's life span might curtail her tour of duty aboard the starship. "Who knows where I'll be or what I'll be doing 10 years down the road?" she says. "I hope I will still be acting and it would be nice if I was still with Star Trek: Voyager. If I wasn't, then hopefully I would be exploring other avenues of my career that I haven't travelled down yet." 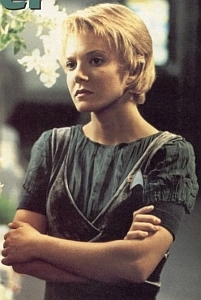 Whatever Kes' future, Jennifer Lien couldn't be happier being part of Star Trek. "It's wonderful job to have," she says. "I enjoy playing Kes, and that makes the work rewarding. The people I work with are fantastic, and I'm often very pleased with the storylines. I've also enjoyed getting to know more about Star Trek - seeing how it works and what goes into it. "It's a very positive experience for me and I know that I'm quite fortunate to be in this kind of situation right now in my life. Text from Star Trek Monthly - #19 - September 1996 - Page ? ?